Home » Everest » Everest 2018 Coverage » Everest 2018: Wave 11 Recap – All over after 11 Straight Summit Days! I was told yesterday, 23 May, by Gyanendra Shrestha the senior representative of the Ministry Of Tourism & Civil Avation. Kathmandu at Everest Base Camp “a few more” will try to summit Everest this season. But as of late Thursday 24 May on Everest, it appears to be over. Several of the more ambitious expeditions on Everest have not succeeded this year. #Everest2018 appears to a record summit year. I estimate 715 total (476-Nepal, 239-Tibet). 2017 had 648 (411-Nepal, 237-Tibet). The record was 667 in 2013. An unprecedented 11 straight summit days made it happen plus unusually warm temperatures on many days. Long time guides have talked a lot about “perfect” days and never experiencing anything like this. The final numbers will come from the Ministry (Nepal only) and the Himalayan Database for both sides. 8000ers.com Eberhard Jurgaliski tracks all the 8000ers, whereas the HDB only does Nepal and Tibet. Unfortunately, he might have to end his efforts due to lack of financial support. He is asking for help at this site. Tenji Sherpa and Jon Griffiths summited Everest, with Tenji not using supplemental oxygen. No mention of their live stream on the Nat Geo Facebook page. 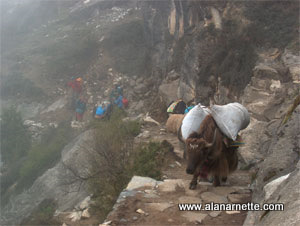 If the weather holds, they will go on to Lhotse by the normal route targeting 25 May. Things on the north side haven’t quite gone to plan. I left north bc on the 22nd with Nima (going for his 22nd summit) and Kami (don’t know surname) with the intention of summiting on the 24th. Unfortunately when we reached the north col the oxygen we were promised wasn’t there and we had to abandon. As we were the only three left on north there was no one to borrow Os from and we had to head down. Not even the last operators at abc had oxygen. Unfortunately I was let down by the provider Himalayan Guides. How I’m going to take it up with them is a question yet to be answered but it has proved a hugely expensive trip! The three of us had to turn back and now looks like the weather window has closed! Both me and Nima were gutted! And now heading back to ktm. Horia Colibasanu and Peter Hámor on the Nepal side hoping to summit via the West Ridge then traverse to Lhotse. They have cancelled due to conditions. OK, I have a couple more posts to get out including my annual season summary that should be posted in a couple of days. As always, thanks for following along and a sincere thank you to all who made a donation to support Alzheimer’s research – this is why I do this. Thanks Alan! Can’t wait for the k2! Amazing coverage feels like you are there thanks Alan. Thank you so much for covering Everest climbers. I am not a climber just a Geography buff that loves mountains and every year I tune in to your site to follow climbing season. My dream has always just been to see the Himalaya’s I just can not fathoms reliefs the rise that high from the valleys below Lukla to 8848 meters. What a sight it must be, no less to climb. Again, thanks for all your coverage. Gene safely enjoying the 3000 foot mountains around me!